AFTER NEARLY TEN YEARS OF PLANNING, many impassioned protests by environmentalists, and a construction period of some three years, Manchester Airport's second runway officially opened on Monday 5 Febuary 2001. EWM braved rain and muddy footpaths to witness the historic take off, looking from an observation point to the south of the A538. LOOKING ACROSS MANCHESTER AIRPORT's second runway towards the main terminal building, a British Airways Boeing 737 lands on the old runway, just as the first commercial flight to use the new runway is waiting to take off. It's Monday the 5th of February 2001 and the time is around 2.05pm. Our viewpoint is just south of the A538, on a hill created as part of the second runway development. Nearly four years ago anti-aviation protesters camped out in trees close to this spot. I am standing on the stump of one of the trees cut down as part of the project. The new runway extends for two miles (3km) off the left of the picture into the Cheshire countryside, and looks like a giant empty motorway, ending abruptly near the village of Mobberley. Will this 'motorway into the sky' lead to new economic prosperity for the north west, as the Ship Canal did over 100 years ago? Almost certainly, but at some environmental cost, as anti-runway protesters and many residents of Mobberley will tell you. 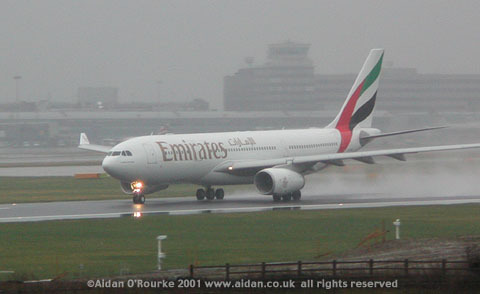 THE EMIRATES AIRLINES Airbus A330-200 pauses for a low key inaugration ceremony at the top of Manchester Airport's second runway, which officially opens today 5 Feb 2001. Emirates won a charity bid, securing the honour of operating the first commercial flight to take off from the new runway. The buses and other vehicles will soon carry, airport staff, the media and visiting VIP's down to the far end of the runway to allow a good view of the plane taking off. A police helicopter hovers above, its occupants keeping a watchful eye on what's happening on the ground. In the co-pilot's seat on today's flight is local lad Simon Hurt, who went to Fred Longworth High School in Tyldesley. EMIRATES FLIGHT EK036 gathers speed as it commences the first take off of a commercial flight using Manchester Airport's £172m Runway Two. The main terminal building and control tower are visible in the distance. The beautiful A330-200 airliner sports the Arab league colours of the UAE flag on its tail, and in Arabic the word 'Emarat', meaning Emirates or United Arab Emirates on its white-painted fuselage. Award winning airline Emirates is based in the tiny but economically vibrant Gulf emirate of Dubai, commercial capital of the UAE. It's just after 2.15pm on Monday 5 February 2001 - The plane is 65 minutes late due to a delay on the incoming flight. Leaving a trail of fine spray and with a low whine from its twin engines, the plane will shortly lift off and disappear into the grey clouds hanging low above the Cheshire countryside. In seven hours the leaden skies of north west England will be a distant memory as the plane touches down in a warm nighttime Dubai. EWM lived in the UAE from 1992 - 1996 and published his first Internet photo articles from there in 1995. SEE THE VERY FIRST ISSUE OF Eyewitness in Manchester from January 1997, all about the Second Runway. Hill House (left) was one of the properties which had to be dismantled to make way for the new runway. 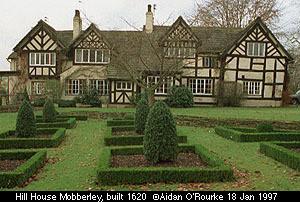 The house was three and three quarter centuries old when compulsorily purchased by the Airport Authority in 1998 and taken down. It has been re-erected in another location.